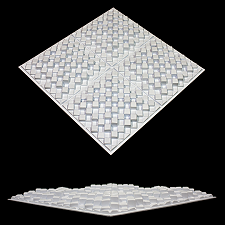 The Art Diffusor® Model F is a patented, two dimensional, binary array diffuser. This diffuser improves sound clarity and ambience while increasing the overall perceived space of the room. The Model F reduces flutter echo and can be used in spaces where a low profile diffuser is required. The range of the Art Diffusor® is extended over other designs by its unique angled end caps to further control specular reflections above 4 kHz. The animation to the right is intended to help visually demonstrate the process of sound diffusion from a single sound source. The Model F Art Diffusor deflects the sound on two planes, a result of the angled end caps and the various well depths. The Model F Art Diffusor® can be mounted directly to the wall or ceiling using construction adhesive and mechanical fasteners or dropped into an existing T-bar ceiling grid. 25 in. 25 in. 27 in. 25 lbs.